Craft show season is a busy time for handmade businesses and there’s a lot to do to prepare and usually very little time. Being more right brained, I was never the best at time management and logical planning. I kind of just went with the flow and panicked the week before a show, pulling all-nighters to build up my stock. Practical? No. But I did learn several valuable tricks to getting lots done in minimal time. 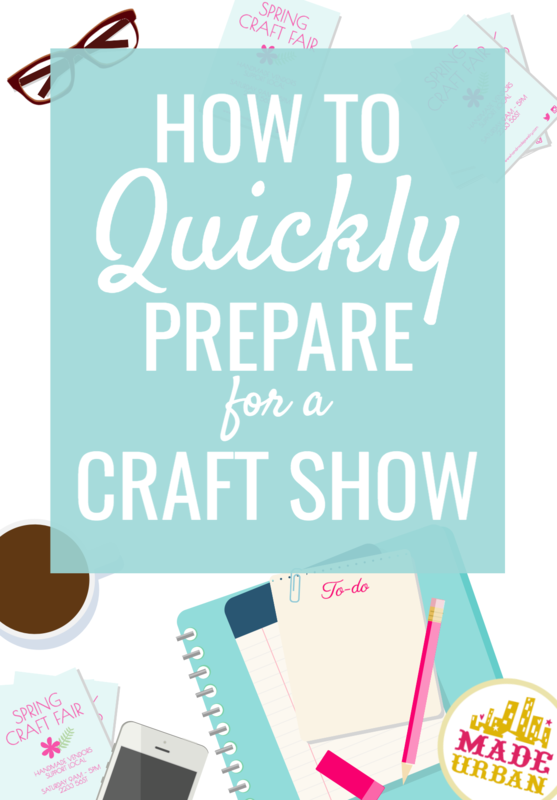 If you’re in panic mode right now, wondering how you’re ever going to be ready for your show this weekend, try out these tips to make fast work of a long list. Take a moment to logically think about what you really need and don’t need, product wise, for this upcoming show. I would always have these “genius” ideas for new items and spend extra time making them, when most of the time, I would only sell one or two. These last minute additions would derail my craft show preparation and distract me from what I really needed to do to get ready and ensure top sales. More selection is not always better. Focus on your best sellers and build a strong presentation of who you are as a business and what you sell. 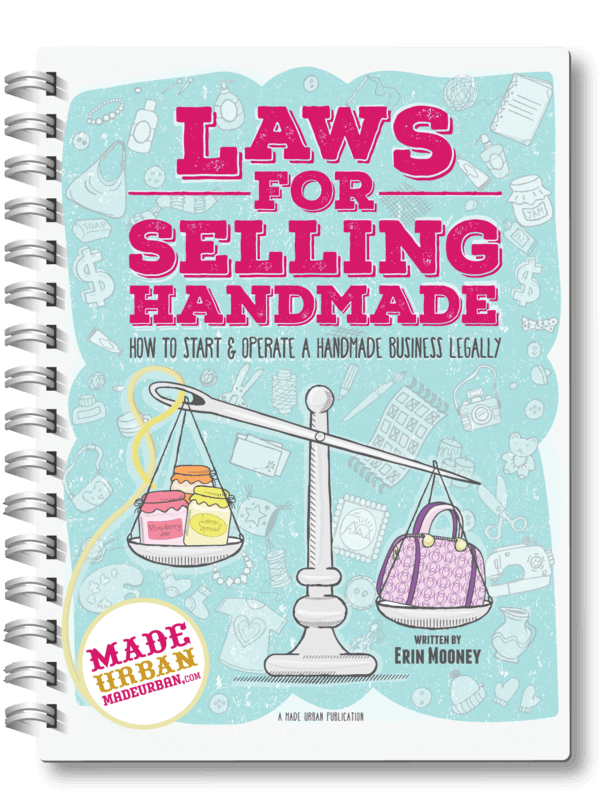 I recommend my free download from MAKING PRODUCTS THAT PROFIT to anyone selling handmade products. Use it as a checklist to make sure you’re on the right path or as a guidebook to get you re-thinking your selection and discovering where you’re going wrong and what you can improve. Download the free sample chapter here. Of course you don’t want to compromise the quality of your handmade goods but don’t get hung up on small things that the customer won’t notice. Price sticker not placed perfectly straight? Move on, it won’t stop someone from purchasing at the craft show or tarnish your brand. You’d be surprised at how much quicker you can prepare stock by creating an assembly line for yourself. Break your production down into stages that have you working in the same area, with the same tools and being in the same groove. Assembly lines are used in mass production for a reason! Having to switch between 10 different patterns, materials and tools is going to slow you down. As mentioned in the free download MAKING PRODUCTS THAT PROFIT, finding a niche and narrowing your focus has so many incredible benefits. Consider whether you can focus on preparing just a few products at your upcoming craft show and stock up on those. Give yourself an hour to complete all your cutting and prepping then take a little break, the next 2 hours can be dedicated to assembly then lunch, etc. Working like this helped me keep my head down, be aware of the clock and have a little break or reward to look forward to once I was done a big task. I even liked creating a little challenge for myself. You don’t want to stress yourself out or be rushing so much you end up wasting time by having to fix mistakes. But do push yourself a little. Made 10 items last hour? Try going for 11 or 12 in the next. It boosts your energy and keeps a fire lit under you. You can even expand time chunking into full days or weeks. The less time you spend switching back and forth and knowing where your focus is, the less time you waste trying to re-focus. If you have a month to prepare before the event, spend a few days scheduling all your blog and social media posts so you don’t have to worry about them everyday. Spend another few days preparing all your materials (eg. cutting all your pattern pieces), a week assembling and another week focusing on finishing touches (eg. cutting threads, adding price tags, etc.). The last week can be focused on perfecting your setup, packing up props and products and any other last minute tasks. Is there an area that always seems to slow you down? Maybe it’s measuring. Create a reusable template for cutting and marking. If it’s pinning your tissue pattern pieces in place, cut them out of a heavier paper so you don’t have to take the time to fuss with it. Create something you can line your pieces up to so you know exactly where to cut them each time or place a detail without having to measure. Templates will help you prepare for a craft show much faster. Turn off the notifications on your phone so you’re not distracted by Facebook messages, emails or Google alerts. It’s easy to say you’ll just ignore them but for me, if I hear my phone beep, I cannot resist quickly checking to see who it is…..and then “quickly” reading or “quickly” responding. Turn everything off and use your breaks to check your phone, email, social media, etc. 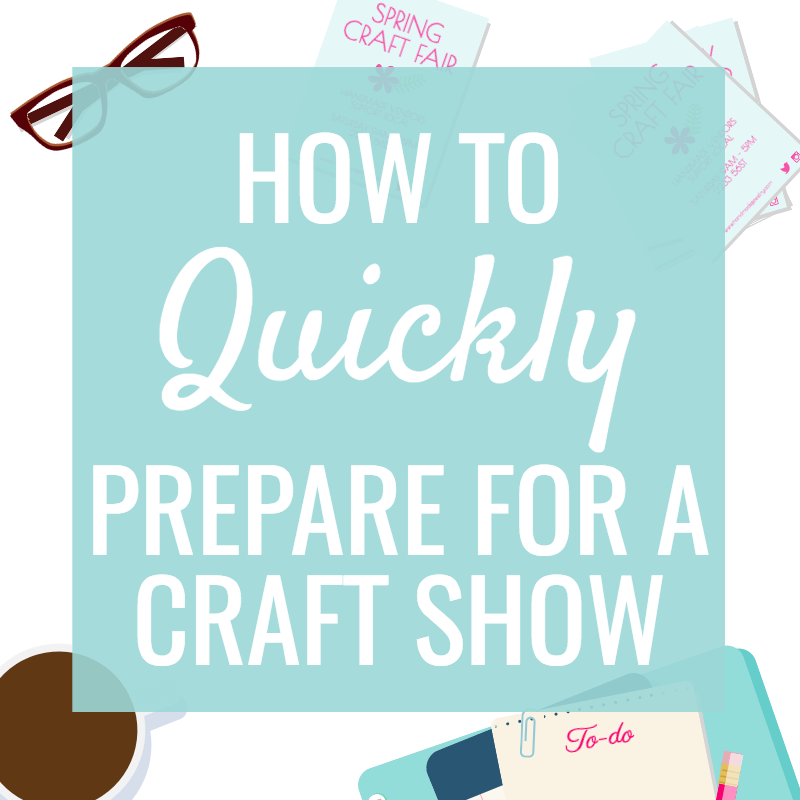 while you’re preparing for a craft show. This honestly was the number one time killer for me. It seems small but it makes such a huge difference. Don’t just cheat and put your phone across the room. Even the sound of a notification is enough to take your focus off the task at hand and your head out of the game. Make your work area a work retreat. Turn it into a space you love to go into to forget about everything else and zone in on what you love; creating. Speaking of eliminating distractions, take some time to tidy your workspace and put everything in its place. Yes it’s time away from creating and preparing but sometimes you need to take one step back in order to take two steps forward. Schedule your tidy breaks depending on how messy you get as you work. It can either be the last 20 minutes at the end of the day so you get to walk into an organized room the next day or every couple hours if you’re getting really out of control. If you have to look at a mess every time you start working, it’s going to distract you and take you longer to get into that zone. I’ll use any excuse to procrastinate and something as small as having to clean before I work will make me put that work off a little longer than I need to. Yes it’s hard to give up control when you have a specific way of tying a bow or making a tag, but we could all use a helping hand once and a while. Grab whoever you can to help with the little things like snipping threads, adding price tags or packing bins. Bribe your friends with homemade cookies for a couple hours of their time and put them to work. Maybe there’s even a stage of production or an administrative area of your business you can hire out. Virtual assistants are easy to find these days and if answering emails eats into your preparation time before an event, hire someone to take care of emails for you in the month leading up to the show. Be careful with hiring out areas of your production. Some events have strict guidelines when it comes to how much of the handmade product is actually made by you. Give yourself one giant incentive to get you through the hardest preparation hours. Plan a day after the craft show where you’ll allow yourself to stay in bed all day, watch movies, eat pizza and not feel guilty about it. Or maybe a spa day is more your style. Whatever creates one giant light at the end of the tunnel. DON’T FORGET ABOUT YOUR DISPLAY! If you need help with your craft show display, join my FREE 5 day challenge. It’s been really popular and the feedback has been amazing. It’s exciting to hear from so many handmade vendors having “aha moments” as they work through the challenge. Read a bit more about it here or sign up below!